The tune is said to have been composed by Ronald MacDonald of Morar. The two main sources, Angus Mackay’s MS and Donald MacDonald’s book are remarkably similar. The tune also appears in various other collections, based on these settings. In Binneas is Borreraig, variation 3 (the ‘edre’ variation) is omitted in error and it is expected that competitors will play it. The ground, at first glance, seems straightforward, but that is not the case. The sheet attached here illustrates 8 different ways of transcribing two of the phrases within the first line! Kilberry, in his Sidelights, illustrates this complexity – there are 12 semi quavers in the first line and 11 of them are qualified in some way, usually lengthened to a degree, or with pause marks on them. The handling of these semi quavers is one of the key features of the tune and gives the melody its breadth and drive, particularly towards phrase and line endings. At the commencement of line 2 a choice has to be made of how the cadence to B and subsequent D are handled – either by lengthening the E in the cadence and coming off the B on to the D, or by pointing the B and drifting through the D doubling up to the E.
Thereafter, the tune is quite straightforward, but the relative tempos of the variations is paramount. This bottom hand tune is a considerable technical and musical challenge. Time signatures are given as 3/4 in PS 2 but common time in K. Whatever the time signature, the tune follows a three pulse phrase pattern. PS and K also illustrate different possible timings of the Cs and Bs following cadences in lines 1 and 2 of the ground. An optional additional line 3, from the Campbell Canntaireachd, is also shown in the PS version. The notes on page 43 indicate that, although this gives the tune a peculiar and unique construction, it was definitely played by some pipers in the past. Competitors who intend to play the optional line 3 should advise the judges before playing. The variations all follow the same straightforward pattern but it will be important to capture the mood, tempo and balance of phrasing appropriate to the tune. A crunluath a mach is normally played in this tune and Binneas includes a taorluath a mach. The tune is not well written in PS and Kilberry. In particular, one would not expect variation 3 doubling to be played as written, with the initial B of the second phrase played short. A three-pulse ground is usually heard. The second pulse should not be short, as this restricts the scope for showing these notes to best effect in the variations. 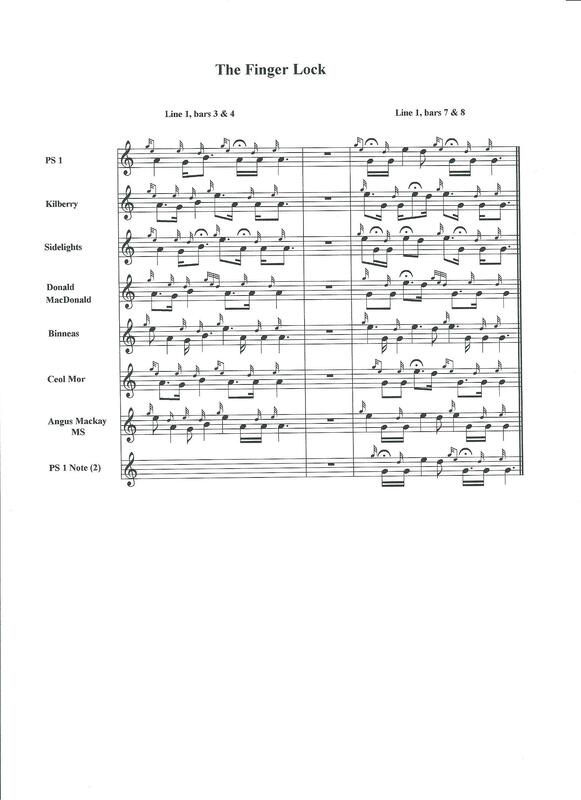 Consideration of the detailed comments in Kilberry’s Sidelights leads one to conclude that our playing of this tune has become rather stereotyped, and that much more variety of expression was the norm a couple of generations ago. There are many ways of expressing the tune and a good number of recordings exist, demonstrating different styles. The tune cries out for personal interpretation by the piper. Thought to be the only secondary piobaireachd in 3/4 time – the others are all in 4/4. The fifth and sixth bars of line 3 of the ground are often played in the Donald MacDonald style, as described in note 2 on page181 of PS6, sometimes with the F in bar 6 omitted. Although a few pipers play a ‘run-down’ in this tune it is not usual to do so. Careful thought needs to be given to the expression of the grips towards the end of the ground. The PS setting has four ‘hiharins’ at the end of each variation; Donald MacDonald has only two. Variation 1 needs to be kept flowing and should not become too regular or static. Variation 2 may be played in the conventional way, i.e. as a normal siubhal (e.g. Glen’s setting) although the timing shown in PS was felt to be a feature of the tune, requiring subtle expression. In the Donald MacDonald setting, the double echoes on E and the ‘hiharins’ may be played either as written or in the conventional way. The judges should be informed of any such changes. A Donald Mor rundown at the beginning of line 2 is a possibility. It does not seem that Angus Mackay intended this (whereas, in his published book, a rundown in The MacDonalds’ Salute is clearly intended). The tune is reminiscent of The MacDonalds’ Salute in the ground and variation 1; probably the same tune at one time.